For 2016, NASS and BMX Worlds have teamed up for a massive contest that’s going to be a wild one. The crew at Ride UK sat Mat Hoffman down on his backyard vert ramp to talk a little bit about the contest and a number of other topics. Hit play and take it all in! “NASS questions Mat Hoffman about NASS 2016 x The BMX Worlds, discussing his whole career, past highlights, injuries and future plans. “After 30 years of BMX in the “Kölner Jugendpark” our motivation to organize this event has not changed. We always were driven by the passion for our sport BMX. To provide a platform where BMX is recognized as a sport and culture rather than a circus or stunt-show has always been in our focus. 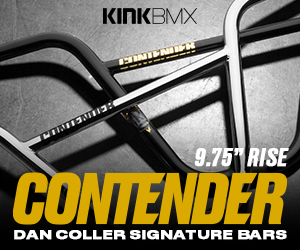 To show the variety that BMX has to offer has always been a main part of our concept. BMX at the Jugendpark has become a ritual to us and to thousands of BMX lovers from all over the world. In 2015 the BMX CGN will take a break. It’s time for a concept overhaul and to give the venue the opportunity to improve its infrastructure to secure the future of BMX at this very special location. Since 2011 we have been facing higher standards and restrictions set by the City of Cologne year by year. Now it has reached a level that makes it impossible for us to proceed the way we did it in the past. We were working on solutions, but for this year’s event we are running out of time. Nevertheless, we wish you an awesome BMX summer!! Thank you for the support over the last years & keep on riding!! “NO WAY we will not have something going on at the Jugendpark in 2015”! Keeping alive our tradition of the last 30 years we will organize a small get-together for the BMX family. We’re bringing back the 80´s and going back to where we started. Come and join us for another fun day of BMX in Cologne. More information can be found on the BMX Cologne Website. With the 2014 BMX Worlds coming up, Gunnlaugur Steinar Halldórsson decided it was finally time to piece together the footage from the trip he took with his friend Sindri from Iceland to Cologne, Germany last year! This video gives us more of a look at the riding they got in at some of the local parks and spots along with a little footage from the actual BMX Worlds setup they rode. Overall it’s well worth a look! Check out this damn good video that Freedom BMX dropped giving you a bunch of highlights from park, street, dirt, vert and flatland at the BMX Worlds last weekend! Definitely hit play because I know you want to see this! Nobody likes seeing dudes get broke off, but EVERYONE loves seeing it happen. Check out this video Freedom dropped giving you a look at some of the wild crashes guys were taking during the BMX Worlds this past weekend! There’s a couple rough ones for sure. Make your way over to Flat Matters for part 3 of the BMX Worlds photogalleries by Ronny Engelmann! Tons of dialed flatland photos to check out! Head over to Flat Matters to check out an interview with Adam Kun about winning the BMX Worlds this past weekend! Good read and some rad photos! Head over to Flat Matters for the second round of photos by Ronny Engelmann from the BMX Worlds. This time around they’ve got some great shots from the AM guys!